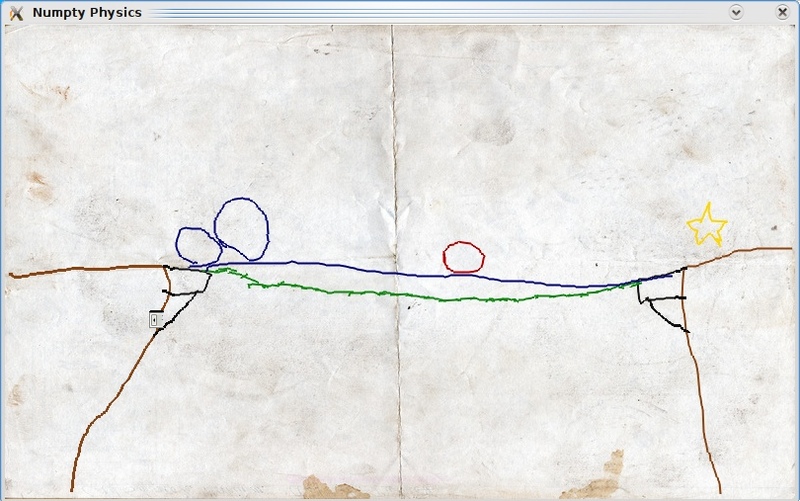 Crayon Physics is a fascinating 2D physics sandbox/game, which came to my attention today when I was reading Sarinee Achavanuntakul’s blog entry about the sad HotU (Home of the Underdogs) demise and, more than welcomed, revival. Sarinee mentioned Crayon Physics Deluxe in her blog post, and I checked it out. What I saw in the flash video was jaw-dropping. Crayon Physics is not just an indie game, but imho a great educational tool in which you really get to experience “what it would be like if your drawings would be magically transformed into real physical objects”. I wonder, is there an open-source counterpart for creative use of physics? Update: There is a wonderful open-source alternative, called Numpty Physics, with lots of different levels. Thanks Mike, for pointing to it. Also, nuclear mentioned a physics engine, called chipmunk. Check it out. Numpty Physics is one. It is not as well put together as Crayon Physics, but it is one option. There’s a very nice free software 2D physics library called chipmunk ( http://code.google.com/p/chipmunk-physics ) which easily supports all the features needed for such a project. I did a simple physics test with that library recently, and it’s got a very simple and easy to use API. Thank you all for the answers. I think Numpty Physics to be very similar to Crayon Physics. I am not sure how useful it is for kids but it has fun!